Naloxone is an opioid antagonist, used as an “antidote” for opioid overdose which includes heroin, and opioid pain medicines such as morphine, fentanyl and codeine. It has been used since the 1970s by ambulance services and hospital emergency departments, and in these settings has been shown to be safe, reliable and effective. Naloxone does not produce intoxication and has no effect on people who do not have opioids in their system. Over recent years, programs have been established in a number of countries to supply naloxone to people who use opioids, and their carers, family or friends to enable naloxone to be administered by a trained layperson in an emergency to prevent fatal opioid overdose. These programs have been found to reduce overdose deaths, with few adverse events reported. 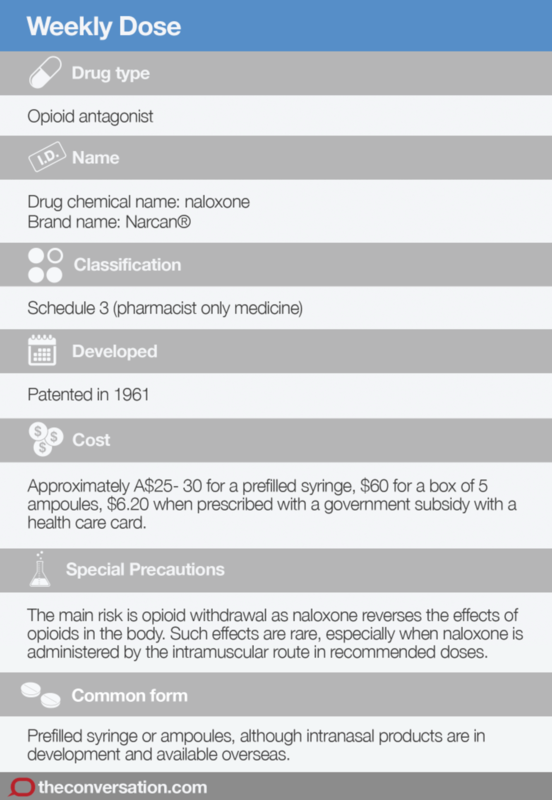 In Australia in February 2016, naloxone changed from being available only with a prescription to also being on sale over-the-counter in pharmacies. This aimed to make it easier for people who may witness an opioid overdose to access naloxone and keep it on hand. Naloxone is a competitive opioid antagonist, with high affinity for opioid receptors (the parts of the brain where opioids work) in the central nervous system. This means naloxone will compete with other opioids, such as heroin or morphine, to bind to the opioid receptors, knocking other opioids off the receptor. Naloxone has no opioid effect at the receptor, and importantly in the case of an overdose, reverses the effects of opioids already in the body. As opioids depress respiration, when naloxone reverses this effect, it helps to restore respiration. Naloxone was developed by chemist Jack Fishman more than 50 years ago in an attempt to treat constipation from opioids. Since then it has been widely used to reverse the effects of opioids by paramedics and in hospitals. In the past 20 years, there has been a large expansion of programs where naloxone is supplied for people to take home for layperson administration (for a bystander who witnesses an overdose). These programs have been recommended by the World Health Organization in response to rising opioid-related deaths. In Australia, take-home naloxone programs have been operating in various states and territories, largely as small demonstration programs, since 2012. Many pilot programs involved peer advocacy groups and were operated through services for people who inject drugs. More recently, naloxone has become more embedded in routine health care in a small number of health services in NSW. Potential overdose bystanders (friends or family of people who use opioids) are trained to identify an overdose, call an ambulance, administer naloxone and start basic life support while they wait for the ambulance to come. In Australia, it is usually given as an intramuscular injection (an injection into the muscle), and starts working within a few minutes. Usually a first dose of 400 micrograms is administered in the shoulder or thigh, followed by a second dose of 400mcg if there is no change after two to five minutes. Naloxone has a short half-life so effects can wear off in 30 minutes to an hour. 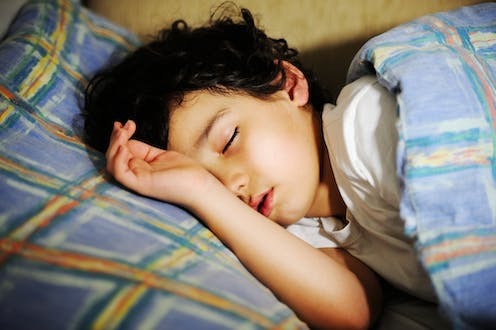 The person can then return to an overdose state, so it is important an ambulance is called and the person is monitored by others even if the initial dose has worked. Is naloxone just for heroin overdoses? Naloxone will reverse the effects of any opioid – heroin or pharmaceutical opioids. 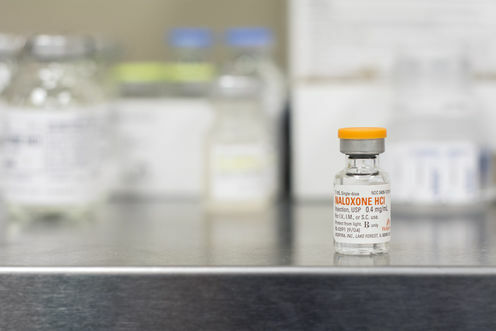 A common misconception is that naloxone is not effective for potent opioids such as fentanyl or buprenorphine, but with higher doses, naloxone does work. However, supporting breathing and calling an ambulance becomes even more important with stronger opioids. In Australia, most (70%) fatal overdoses now involve pharmaceutical opioids, with heroin involved in only three out of ten opioid overdoses. The main concern is that after reversing the effects on opioids in an individual, they will experience opioid withdrawal. This is less common with the doses used in Australia though it was more common when larger doses were routinely used. One concern with inducing opioid withdrawal symptoms is that a person may feel quite unwell, and then use more opioids to feel better, which may lead to a subsequent overdose. The main challenges with naloxone are around the way it is delivered. Not all people feel comfortable giving an injection. The pre-filled syringe is relatively easy to use but there is currently very limited stock in Australia. Ampoules are a little harder to draw up and administer the naloxone, but have been successfully used in Australia and internationally. Intranasal formulations (nasal sprays) have been developed in the United States but there are concerns about how much of the naloxone is effective, and what dose needs to be given when administered in this way. SN is supported by a NHMRC Research Fellowship (#1013803). The National Drug and Alcohol Research Centre at the University of New South Wales is supported by funding from the Australian Government under the Substance Misuse Prevention and Service Improvements Grant Fund. SN has been an investigator on untied educational grants from Reckitt-Benckiser and Indivior. Simon Lenton is supported by funding from the Australian Government under the Substance Misuse Prevention and Service Improvement Grants Fund through its core funding of The National Drug Research Institute at Curtin University. For more than 10 years he has conducted research based advocacy calling for the wider availability of naloxone. Splash Out With the Whales in Hervey Bay These School Holidays!